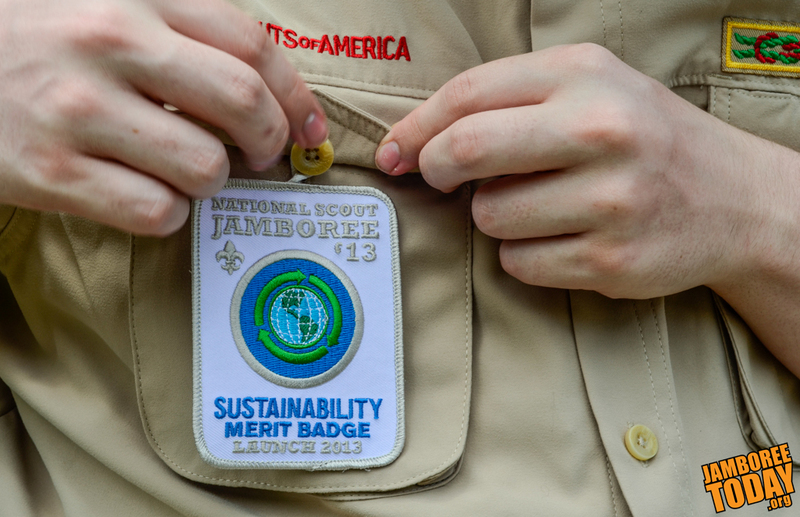 "There's no such thing as waste," says merit badge counselor Scott Harmon about the new Sustainability merit badge was unveiled on July 15 at the 2013 National Scout Jamboree. Scouts will have the opportunity to earn up to two-thirds of the badge during the week. "We're using three planets, and we don't have three planets," says Harmon. He says the way humans are currently using resources on Earth creates a destructive cycle of waste that can be avoided. The Sustainability merit badge helps Scouts learn about sustainable solutions to these problems. The lessons are the basis for teaching Scouts how to bring sustainability back to their families and communities. While related to the existing Environmental Science merit badge, Harmon explained that Sustainability focuses on the big picture of global resources rather than the specific biology discussed in Environmental Science. To earn the Eagle Scout rank, Scouts must choose one or the other to earn. "The merit badge talks about big problems due to the way we're living," says Harmon, a Portola, Calif. native. Harmon's vision and leadership paved the way for the badge that aims to create sustainable families, communities and, eventually, cities. By visiting the tent located in Scott Summit Center and completing at least three Sustainability requirements or attending one of many career sessions, Scouts can earn a commemorative patch, says Harmon, an Eagle Scout. In addition, the Scouts who propose the best community sustainability plans will receive a "trash amp" — a recycled speaker that works with MP3 players and guitars. The Sustainability merit badge will host several special appearances: Glenn Prickett, the chief external affairs officer at The Nature Conservancy, will visit on July 19 at noon and 4 p.m. Dr. Sylvia A. Earle, a National Geographic Society Explorer-in-Residence, will visit on July 22, at noon and 4 p.m.